Many companies have trouble keeping track of supplier information. There are contacts on a contact list, phone numbers on another list, and addresses still elsewhere. Wouldn’t it be nice if you could have all of that information in one place? You can keep track of all of your suppliers with this easy-to-use Supplier List Template. It’s even customizable so you can fit it to your own business needs. Best of all it’s free to download right here. First you need to download the Supplier List Template. It’s right on this page and it’s completely free. Customize the list to your needs. You can add or remove any of the fields so that they contain the information that you need. Save a copy after you customize it in case you need it again. It is likely that you will need another page at some point. Fill in the fields with all of the important information about your suppliers. Be sure to include every supplier that you use, even if they are occasional. Keep your supplier list in an easy to find place so that you don’t lose your supplier information. Be sure that you include every piece of information about your suppliers that you may need when you customize it. That way you have it when you need it. Store the Supplier List Template on your computer so you know where it is if you need to print another page in the future. Remember to fill out the supplier list completely so that you aren’t missing something later when you need it. Keep your supplier list in a plastic sleeve. This will help you if something spills on it. Store the supplier list in a place that’s near where you most need it and also where it will be easy to find. Your company will love having all of their supplier information located on one simple list. 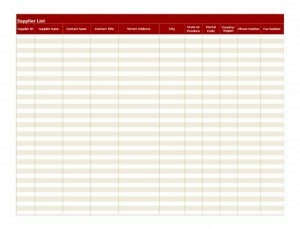 The Supplier List Template is easy to use and completely customizable. Download it for free right now.